The #StopAsking Facebook post by freelancer Emily Bingham that went viral. I’d bet you good money that every woman has been asked this question at some point in her life. More than once. This question is almost always well-intentioned but, at the same time, works on the assumption that not only is procreation inevitable, but something that every rational woman wants – carrying with it the implicit suggestion that motherhood and womanhood are inextricable from one another. It’s a loaded question – and it’s always a question of when, not if. When my partner and I moved into our new house, the previous owner took us to a block party to meet our new neighbours. Not being the most social people, we clutched our plastic wine cups and did our best to smile and nod politely as our new street-mates sent a barrage of questions our way. Most of them were the normal sorts of things you ask strangers at a party: What do you do for a living? Where did you live before you came here? That sort of thing. My partner, especially, got asked about his work and career plans. I, on the other hand, finding myself trapped in conversation with a woman whose name I awkwardly could not remember, found myself fielding questions (and comments!) on what I was planning to put in my uterus, and when. (No if, only when.) The same old question women get asked at every turn: when are you going to have a baby? Just stop. Please stop. You don’t know who is struggling with infertility or grieving a miscarriage or dealing with health issues. You don’t know who is having relationship problems or is under a lot of stress or the timing just isn’t right. You don’t know who is on the fence about having kids or having more kids. You don’t know who has decided it’s not for them right now, or not for them ever. You don’t know how your seemingly innocent question might cause someone grief, pain, stress or frustration. Sure, for some people those questions may not cause any fraught feelings — but I can tell you, from my own experiences and hearing about many friends’ experiences — it more than likely does. Bingham’s post captured our attention because in it, she puts her finger on why we get so irritated by this line of questioning. While the formulation of the question hasn’t changed over the years, young women’s attitudes to childrearing (and society’s expectations for it) are starting to shift – something that my neighbour (whose name I still don’t recall) and those like her are not keeping up with. The results of the US 2014 Census, for example, confirmed what you might have already known: 47% percent of women (between the ages of 15 and 44) have never had children. A survey conducted by New York Magazine indicated that young American women were increasingly choosing not to have children, for a variety of economic, social, environmental and personal reasons. And Australian data reflects this trend of voluntary childlessness, though on a less dramatic scale than the US results: our 2014 census showed that 14% of women in a similar age bracket had never had children. In the developed world, the rate of women voluntarily abdicating from the role of mother is generally on the rise. To put it simply, some of us just don’t want kids. Others can’t have them, even though they want them – because they can’t conceive, or they cannot afford them. Which is why this question, coming out of the blue from a someone you barely know, is not simply tricky to answer: it’s downright impossible to have this conversation without upsetting someone. However, the solution is simple: #StopAsking. 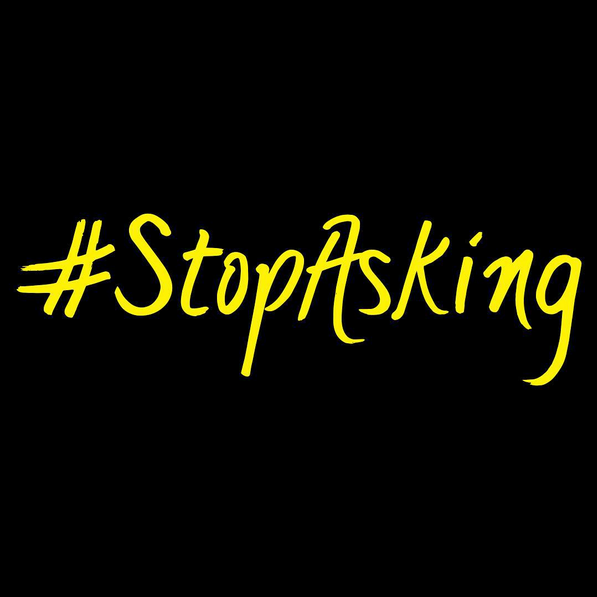 #StopAsking is a clarion call, a social media shoutout crying for everyone to stop asking us these personal, invasive, and simply rude questions about our reproductive plans and choices. #StopAsking has some very famous supporters. Tyra Banks lent her voice to the campaign, asking that we stop making assumptions and start thinking about how the question might make the woman on the receiving end of it feel when you ask her. The #StopAsking campaign is not calling for an end to all conversations about whether or not we want children; it’s just suggesting that it might be something we should confine to conversations between close friends, and perhaps phrased in a less-presumptive manner. It is not a sign that we are becoming too PC, or too concerned with upsetting someone that we are afraid to ask the hard questions. This is already a hard enough question; it’s just not one that needs to be a matter of public debate. The decision to not have children – whether you make it willingly or have it taken out of your hands by nature – is deeply personal, and it shouldn’t be too much to ask that people stop trying to make it otherwise. I can not agree more! Great read! This entry was posted in Featured, Opinion and tagged children, feminism, motherhood, women, women's issues. Bookmark the permalink.